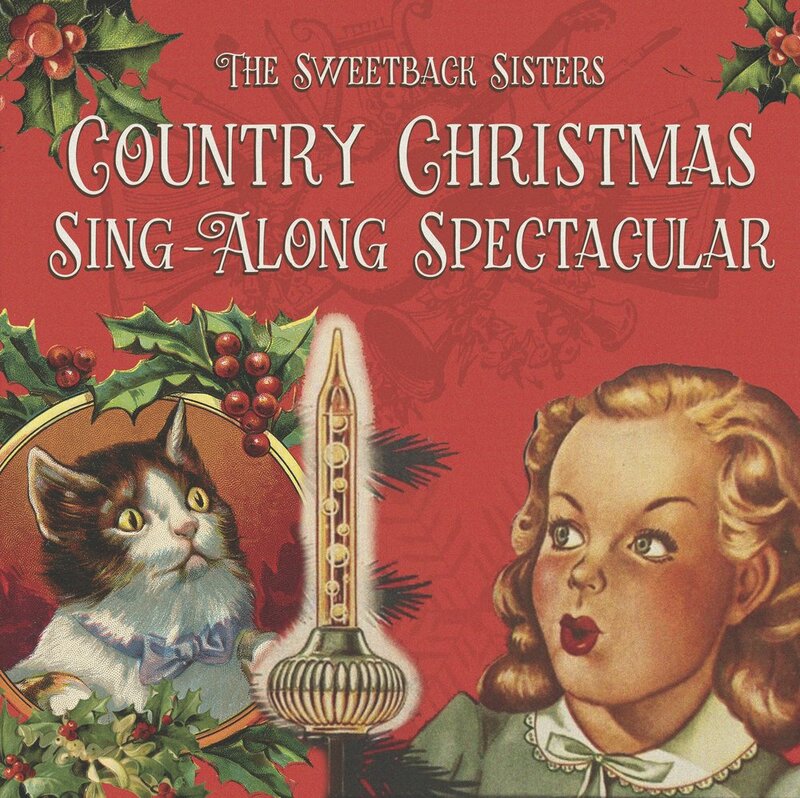 The Sweetback Sisters Christmas staple out just in time for your holiday needs! Fits right under the tree and in your hearts. Pre-order now to get it in time! It's been ten years since The Sweetback Sisters first began forging their distinct sonic universe of golden era country, and on their new album, King Of Killing Time, they push their sound into more adventurous and playful territory than ever before. Centered around the charismatic, airtight harmonies of Emily Miller and Zara Bode, the album's ten tracks are a mix of infectious originals and unexpected interpretations of everything from George Jones to Gram Parsons. Hints of jazz and ragtime flesh out the Sisters' unique brand of classic country and rockabilly rave-ups, as Miller, Bode, and their remarkably versatile band conjure up a singular blend of heart, humor, and virtuosic musicianship. The phenomenal Boston song machine Twisted Pine delivers a cabinet of inventions with its self-titled summer of ’17 debut on Signature Sounds. The all-original album showcases a new force in Americana: four versatile players and singers writing and improvising across forms in bluegrass, folk, funk, jam, and vintage radio pop. With festively unpredictable live shows, Twisted Pine follows Americana masters Nickel Creek and Punch Brothers on a genre-bending, limitless trajectory. Their new eponymous album, due out on Signature Sounds on June 16, 2017, however, finds the Los Angeles-based ensemble evolving and refining its music. Their always-joyous sound now reveals a more soulful, funky side that exudes deeper emotions and taps a more modern vibe. This new album reveals the band moving in an exciting new direction. Instead of Dixieland jazz and Depression-era folk songs serving as musical mile markers, it mines an energizing vein of soul, funk and roots-infused rock that evokes the work of Fleetwood Mac, Paul Simon, Aretha Franklin and classic Stax recordings, and fits the band alongside such contemporaries as Nathaniel Rateliff & the Night Sweats and St. Paul & the Broken Bones. In the 12 years she has toured the world as a member of the soul-pop sensation Lake Street Dive, Bridget Kearney has fine-tuned many things -- voracious collaborating, acclaimed bass playing, and harmonizing to name a few. But the skill she has honed most obsessively is songwriting. While still a student at The New England Conservatory of Music, Kearney won the grand prize in the John Lennon Songwriting Contest, a harbinger of things to come. Now, Kearney steps into the spotlight with her first solo effort, a wry, big-hearted pop album entitled Won’t Let You Down. The record, like its title, promises not to disappoint. Shades of The Beatles, Wilco, Fleetwood Mac and even Nick Cave can be detected, as the album swerves from ‘60s pop to modern indie-rock. From the salvaged sounds of American juke joints, back porches, honky tonks and rock clubs, The Suitcase Junket conjures an entirely new sound in this essential rock collection, Pile Driver. The Suitcase Junket is Matt Lorenz: artist, tinkerer, swamp yankee, one-man band. His is the road-worn voice rising over the grind of a tube-amped dumpster guitar, and the wild double pitches of throat singing. From The Suitcase Junket's penchant for thrift and ingenuity comes this full-length album -- his debut at Signature Sounds -- of original rock anthems, mountain ballads, blues manifestos and dance-hall festivity, played on instruments built of broken bottles, twisted forks, dried bones, gas cans, shoes, saw blades, a toy keyboard, and an overhead compartment’s worth of luggage. Rani Arbo & daisy mayhem’s WINTERSONG skips over the holiday canon — there are no jingle bells here, no mistletoe, and only one fleeting reference to Santa. Instead, Rani Arbo & daisy mayhem dig up the power, the beauty and the celebration at the roots of Christmas. With fierce poetry and wild joy, WINTERSONG is an ode to light and dark, and to the balance of both at the turning of the year. Rani Arbo & daisy mayhem has been praised as a one-band music festival, and WINTERSONG delivers just that. Bluesy, full-band tracks pulse with electric guitar, four-part harmony and fiddle: Jesse Winchester’s “Let’s Make a Baby King,” Tommy Thompson’s “Hot Buttered Rum,” Michael Doucet’s “Bonne Annee,” “Yonder Come Day” from Bessie Jones and the traditional “Children Go Where I Send Thee”. Modern songwriter takes on the holiday — Ron Sexsmith’s “Maybe this Christmas,” Sydney Carter’s “Bells of Norwich” and Chrissy Hynde’s “2,000 Miles” — get a more acoustic treatment with banjos, ukuleles and kalimba. Interspersed like a deep breath between these, pared-down tracks invite the listener to the quick, lean verses of G.K Chesterton’s “A Christmas Carol” to banjo, fiddle, and harmonium. Guitarist Anand Nayak contributes a poignant and intimate reimagining of Longfellow’s anti-war poem, “Christmas Bells.” Arbo’s hushed vocal on the German carol “Lo, How a Rose E’er Blooming,” sounds like a lullaby with quiet banjo and guitar; and the album closer, “Singing in the Land,” floats the band’s four-part harmony over solo acoustic guitar in an Appalachian hymn from the Ruth Crawford Seeger collection. OUT NOW: PARSONSFIELD "BLOOMING THROUGH THE BLACK"
May 6, 2015: Day One in the abandoned axe factory hadn't gone as planned, so today is the first time the five members of Parsonsfield will actually get to make music here. They'd been looking forward to converting this cavernous industrial space on the banks of the Farmington River in Collinsville, CT, ever since singer/banjo player Chris Freeman, who grew up nearby, brought it to their attention. The idea of recording in such a reverberant, reactive space held great appeal after the past six months spent in Canada exclusively performing their critically acclaimed original songs for 'The Heart Of Robin Hood,' a musical that required them to wear in-ear monitors for eight shows a week in theaters designed to be sonically dead. They've got their amps and PA plugged in now, and there's a faint layer of sawdust on top of all the gear. It's nothing compared to yesterday, when they opened the doors for the first time and discovered sawdust an inch thick coating every imaginable surface. It was so bad they had to purchase respirators and devote the entire day to sweeping and vacuuming, trying to outwit the neighbor's overzealous guard dog every time they came and went from the building. The whole process left so much dust still floating in the air that every time they take a break, another layer settles back down to earth, but at least they can comfortably breathe now. cool and raucous Celtic rhythms." It was only natural, then, that they called on Kassirer once again for their follow-up, 'Blooming Through The Black,' enlisting his engineering and production ingenuity to help convert the axe factory into a temporary recording studio. In addition to placing microphones on each instrument, Kassirer set up additional mics throughout the factory just to capture the feel of the enormous space, which itself became another instrument in the band's already-impressive repertoire. Parsonsfield spent nearly six months writing and rehearsing in the factory, discovering that song ideas that had begun life in Canada radically transformed in their new home. The space demanded understatement and subtlety to balance out the band's exuberance and energy, and by the time they were ready to hit record, they were sitting on a collection chock full of the most infectious, emotionally mature songs of their career. 'Blooming Through The Black' opens with 'Stronger,' a slow-burner that begins as an acoustic folk number and builds to an electrified tumult. It's a showcase for their instrumental prowess, lyrical chops, and unbridled passion, and it's just the start. The title track—inspired by the sight of the first flowers growing back in the forest fire- charred landscape of Hell Canyon, South Dakota—finds Freeman blending punk energy with earnest sincerity in his delivery, while "Across Your Mind" rides a feel-good groove driven by bassist Harrison Goodale and drummer Erik Hischman, and "Water Through A Mill" ebbs and flows like a solemn hymn on top of Max Shakun's meditative pump organ. As the band explored the quirks and eccentricities of the factory, unexpected sounds and moments sometimes became permanent fixtures of the songs, but a particularly happy accident occurred outside the studio entirely, when Shakun called mandolin player Antonio Alcorn for help setting up his new record player. Upon dropping the needle somewhere in the middle of a copy of 'Poor Old Shine,' they discovered it was spinning backwards, but the melody coming out of the speakers was perhaps even more of an infectious earworm than it was when played forward. They brought the new riff to the rest of the band, where it morphed into "The Ties That Bind Us," a stand-out foot-stomper and a highlight of their live show. Catch Parsonsfield onstage any night and the band's joy is palpable. They trade instruments, share microphones, and shoot each other big grins. They sing in tight multi-part harmonies, their voices blending like they've been doing this together all their lives. That's because Parsonsfield is a family band, not by birth but by choice. And with an album this thrilling, it's only a matter of time before you share their same enthusiasm. Listen closely at the top of "Don't Get Excited" and you'll hear the clatter of a cyclist crossing the rickety bridge over the river. That's the sound of Parsonsfield inviting you into the axe factory. It's time to begin 'Blooming Through The Black.' Good luck not getting excited. But as friendships evolve from adolescence to young adulthood, sometimes the lines between friends, lovers and all that comes in between can grow murky. On the Northampton, MA-based band’s latest, Friends Share Lovers (out June 3rd on Signature Sounds), And the Kids examines blurred boundaries in close-knit relationships. Friends Share Lovers bursts forth with the pent-up emotionality of the opening track, aptly titled “Kick Rocks.” Here drum climaxes interlock with hypnotic harmony vocals, building a tension that crashes like a wave cresting, leaving in its wake glassy flowing melodies. The thematic thread of relationships imbues the new wave elegance of “Friends Share Lovers” and “I Can’t Tell What The Time Is Telling Me.” The title track evokes a Smiths-like juxtaposition of balmy musicality set against poetic turmoil as Mohan wrestles with the complexities of a friendship sliding into a romance. The stunning “I Can't Tell What The Time Is Telling Me” envelops the listener with chiming guitars, oceanic synth textures, and sidesteps into classical melodic motifs. “That track is about getting through tough times with a new partner. It’s about being true to yourself after you’ve fallen in love,” Mohan explains.